The American Cancer Society recommends that you eat nine servings of fruits and vegetables daily, more vegetables than fruits. Veggies provide dozens of disease-fighting nutrients, vitamins and minerals, including those that help protect against the development of certain types of cancers. They also provide dietary fiber and they are very low in calories. Vegetables fill you up without filling you out. Non-starchy vegetables provide the fewest calories per serving. All vegetables are low-calorie, but many are carbohydrate-free and are very close to being calorie-free (defined as providing fewer than 5 calories per serving). Pickles, most varieties of cabbage, such as Napa and Chinese, cucumbers, lettuce (including iceberg, bibb, Boston, romaine and green/red leaf), spinach, summer squash, asparagus, turnip and mustard greens, celery, radishes, cauliflower, vegetable juice, Swiss chard, asparagus, raw pumpkin, and arugula all provide less than or equal to 25 calories per 100-g serving. Many vegetables provide just over 25 calories per 100-g serving, but well under 50 calories. 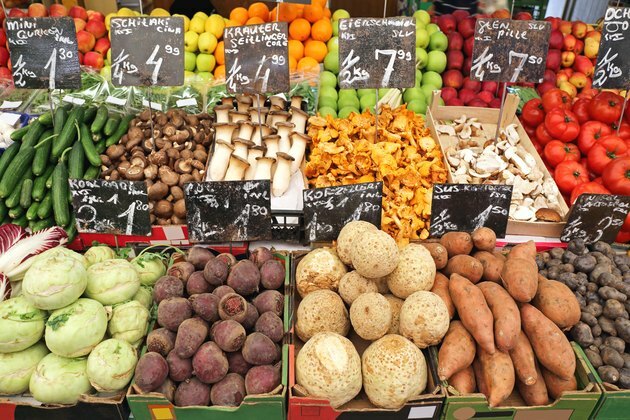 Examples of these low-calorie vegetables include broccoli, collard greens, mushrooms, onions (including scallions and sweet), okra, carrots (regular and baby), beet greens, spirulina seaweed, raw kohlrabi, canned or raw beets, kale, raw sweet bell peppers, turnips, fennel, leeks, garden cress, tomatillos, eggplants, broccoli raab, Serrano, hot chili, and jalapeño peppers, carrots (regular and baby), dandelion greens, canned pumpkin, Brussels sprouts, rutabagas, jicama, artichokes and carrot juice (from canned). All vegetables (unless they have a sauce or extra ingredient added), provide less than 100 calories per 100-g serving. Those considered to be slightly higher in calories, or over 50 calories per 100-g serving, are typically starchy in nature and include potatoes (all varieties), canned or fresh, boiled, or baked (fried potatoes have added fat so they are much higher in calories), certain varieties of winter squash, such as acorn and butternut, most varieties of mixed vegetables (from frozen), peas, from canned or frozen, yellow or white corn, from canned or frozen, yams, hearts of palm, parsnips and all legumes.